Contrary to the photos these are all the same size. I know we have seen the rounded one before but the matter of handles has not been addressed. I wonder if number one is the "D" handle referred to in some descriptions. These are at Coal Town Traders, Hikurangi, thanks Linda. Is that odd handle the same as the ones on those vitrified jugs of yours above Jeremy? Ev, on the cup the upright of the D adjacent to the body is more solid than on the jugs. The shape of the handle is pretty much the same. At this stage I have only the photos to work off. When I first looked at the jugs in relation to the Hotel stacking stuff I presumed the difference in handles was something to do with the way they were made, that the jug handles were made with the body of the jug, but the cup handles were stick-ons. When I looked at these cups today it was obvious the ones with the little tail were stick-ons, but less so the simple Ds, but I assumed they were. There are no 1600 cup descriptions and no cups in the 6600s either so they must be stick-on-handle 3600s. When I was looking at them I was thinking that the middle cups were the odd ones and it wasn't til I got home an connected to the forum I realised it was the other way around. I won't be back at Hikurangi this week unless I make a spur-of-the-moment decision to drive further North on Friday. I didn't buy them because $4 each was more than I wanted to pay for something I had no use for. So ... if you have further questions I will check them out when I can. I see that you and Janice have both changed avatars recently. I had only just put my Cook & Serve avatar on when my boy Tomas did this cute sketch of me: I had to use it. In the following link I document the eggcup/mustard-pot/toothpick-holder as the first, the eggcup, although later they were sold in condiment sets as a mustard pot without lid. If these were designed originally for hotel use they would have had a lid, but for domestic use that is not an issue. Kat & Co. wrote: I think the salt n pepper is correct..Are these the egg cup shape? 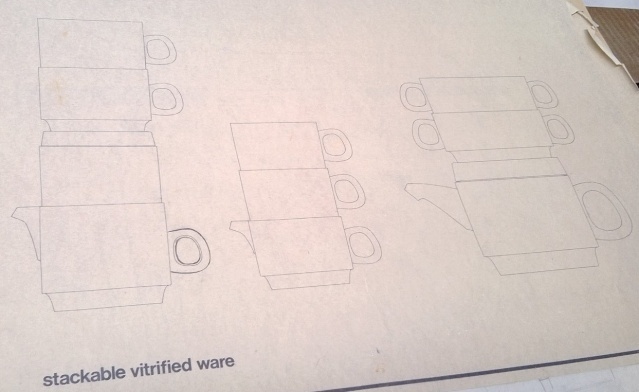 I noted in Mark Cleverley's book that the teapot didn't go ahead and that the saucer was used for both the teacup and the coffee cup and that's why they had double rings. The double-foot-ring locking system for stacking cup and saucer is the same as for Forma. Forma saucers and hotel stacking saucers have the same profile. Stacking tea and coffee cups have the same base. Do we have the saucer number Jeremy? 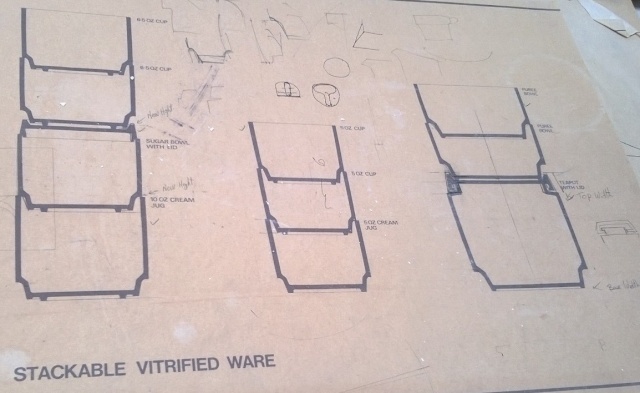 Forma is earthenware so the vitrified saucer will be a different number. I don't mean that they are from the same original like some earlier shapes. For a start the size difference is too big. There are minor differences but they are basically the same design. Yes the 4624 Stacking saucer is in the gallery.